Hot Potato Café on Girard Avenue will star in the season premiere of FOX’s show this Friday. ROMAN KRIVITSKY TTN On Girard Avenue, this cafe hopes to see more patrons after the premiere on Friday. Hot Potato Café barely had potatoes on its menu. Empty jars lined the windowsill from the inside. Paintings of flowering potato roots ran up opposite walls of the waiting area. Hot Potato Café is a small, comfortable restaurant and BYOB situated on Girard Avenue between Palmer Street and Montgomery Avenue. And it woke up from one big nightmare. Though cozy and contemporary, nothing seemed extraordinary about the restaurant. Customers were far and few between, and no one was quite sure whether the location, food or other factors created this problem. This was the case until an anonymous letter was sent in response to FOX’s call for restaurants to spend time rethinking their businesses under the watch of world-renowned chef Gordon Ramsay for his show Kitchen Nightmares. Ramsay started with his shows on BBC, The F Word and Ramsay’s Kitchen Nightmares. He is known for his temper on the U.S. show, FOX’s Hell’s Kitchen. In this series, he screams and curses at aspiring chefs in an attempt to help them develop the skills required to run a busy restaurant kitchen. The American version of the BBC’s Kitchen Nightmares portrays this same temper and Ramsay’s business sense. In each episode, Ramsay takes a restaurant and improves all he can with the staff to help ensure the restaurant’s success. Most restaurants update their décor and revamp their menus in the process. Hot Potato Café was no exception to this regular routine, and deep changes were made throughout the filming of the show’s third season. 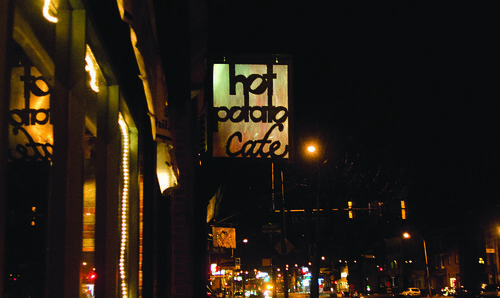 Hot Potato Café has been open since March 2007 and is owned by Fishtown residents and sisters Claire and Kathryn Keller, and their sister-in-law, Erin Keller. They are assisted by staff and their chef, Shaye Lee-Malloy. Claire Keller said she first suspected that the phone call from California was a joke. “A little restaurant on Girard Avenue? We were really surprised,” she said. Claire Keller said working with Ramsay was difficult at times. The curt chef had some good things to say about the Fishtown BYOB. He said the kitchen was extremely clean, the appearance of the restaurant was not terrible, and the butter cake was delicious. Still, Ramsay and the staff focused on the menu throughout May 2009, reworking some old recipes and fitting in new dishes with a tightened up selection centered partially on the restaurant’s namesake ingredient. The inside was also remodeled, the hosting stand was put to use, and two new signs were hung before the café could officially reopen its doors. The most important change was a revival in the Keller sisters’ spirits, Claire Keller said. The work may have challenged their egos but was also fun and rewarding. Hot Potato Café will be hosting a viewing party at the old theater next door to the cafe on 529 East Girard Ave., starting at 8 p.m. The premiere costs $20 and is first-come, first-serve with light refreshments and media presence. Brian Gowen can be reached at brian.gowen@temple.edu. Loco Pez, named one of the best bars in Philly, gains business from all ages. Great article, but Ramsay started on Channel 4 in the UK. Chances are they were then shown on BBC America. I am biased because my family owns this restaurant, but it really is a great place that is pretty inexpensive and has a great atmosphere. It’s cheap enough for students on a budget, especially with it being a BYOB. Brian, your article was great, so when I stumbled across this just a few minutes ago and recognized a few of the paragraphs, I had to let you know that someone definitely copied your work. Sadly, work gets stolen all the time on the Internet. Reprocessed news is a big reason traditional media are taking a nosedive. Since Brian is in Philadelphia and the other site is based in the Philippines, he is the most likely the victim in this bit of plagiarism. As for the show, it reminded this former resident of what he misses about Philadelphia. The Fishtown residents I knew were rough-and-tumble but they had amazing character. I miss the place.